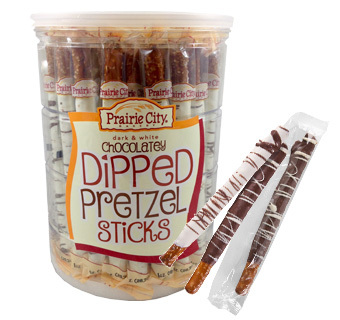 Each 7 ½" pretzel stick is hand dipped in rich chocolate fudge then drizzled with the opposite color chocolate! The perfect sweet and salty snack. These pretzel sticks are dipped in rich white and dark chocolatey fudge. Individually wrapped with a UPC on each pretzel. Place container near your cash register, and you’ve got the perfect impulse item.